I "Heart" Yarn Bag 20% OFF! 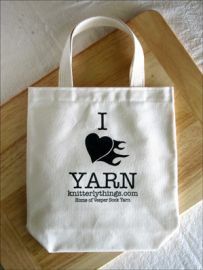 Our *NEWEST* Product, and first ever Knitting bag!! We are SO EXCITED to share these with you! measure 10" x 12" and are 3" wide. The handles are 13" long. sit upright while you knit! These bags will fit at least 3 skeins of our Vesper Sock Yarn! AND a small bag of Knitting notions! we hope you love these bags as much as we do!